Occasionally, the Fat Quarter Shop puts out free exclusive quilt patterns. To celebrate the release of their newest pattern and video for Layer Cake Pop, I agreed to make a quilt using the quilt pattern. This is my first time participating in a Fat Quarter Shop blog hop, and I have to admit that my curiosity on participation won out over my busy “to do before QuiltCon” schedule! I teased out the creation of this quilt through my Instagram account last week, and I am excited to share the finished quilt with you today. The Layer Cake Pop pattern uses a small Layer Cake or (20) 10-inch squares and a Jelly Roll or (40) 2 1/2-inch by width of fabric strips for the background. I could definitely see using a colorful jelly roll for the background and a consistent neutral color to make a fun inverse version of the quilt. I chose to work with the beautiful Desert Bloom line by Amanda Herring for Riley Blake fabrics as my featured fabrics for the quilt top, backing, and binding, and I used Riley Blake Confetti Cottons in White for the background. We have been getting snow fairly regularly since just before Christmas here in my mountain pass town at the very southern end of the Sierra Nevada mountain range in California. 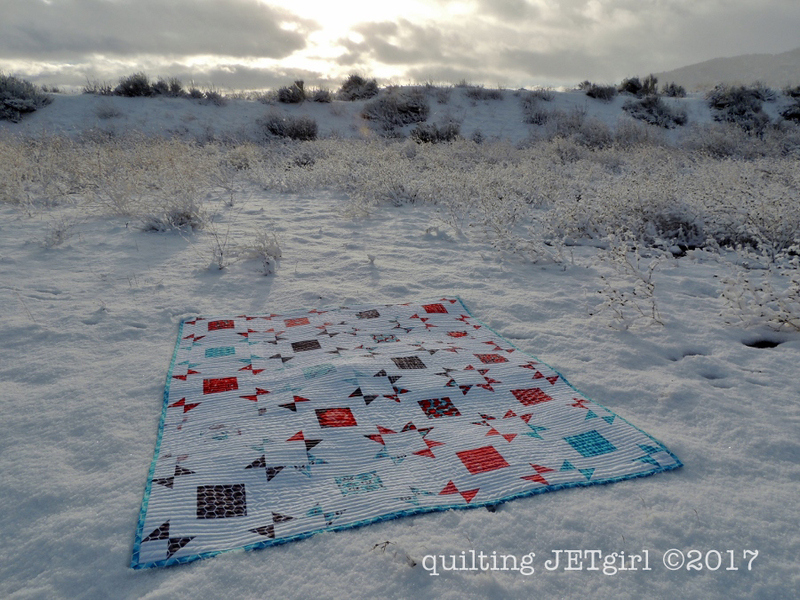 I finished this quilt just in time to dash out between snow fall and even managed to catch the sun peaking out from the clouds for the first time in a week in this photograph! I am very grateful for the moisture we have received in my area; we are still in a historic drought, but every last bit of rain and snow is very beneficial. Thankfully we have not had too much rain leading to mudslides and the snow has all melted quickly. I chose to go with a simple straight line quilting motif using 50wt Aurifil 2024 (white). The lines are organically spaced about ever half to three-quarters of an inch apart. 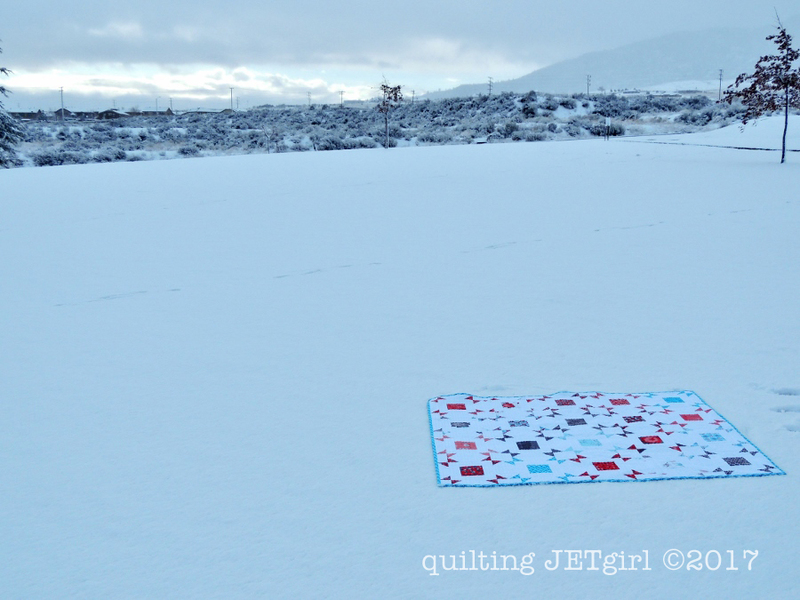 Even with all the white used for the background of the quilt, the Layer Cake Pop quilt really does pop out against the white snow and cloudy backdrop of my local park. I was only the second person to walk to the park the morning of these photographs, and it was a big challenge getting the quilt to lay down smoothly without mucking up the nearby snow for photographs too much! After getting the quilt covered in snow, I gave it a first wash and it finished at 45-inches wide by 56-inches long. Be sure to visit the Fat Quarter Shop post to find the other bloggers who made their own versions of the Layer Cake Pop quilt! Disclosure: The Fat Quarter Shop provided compensation to cover the material costs to make this quilt. Yvonne, I love this. The use of negative space truly works. The quilting is so simple but fits the design. Hello Yvonne! How wonderful that your part of this world we live in is receiving some of the much needed moisture. Thankfully, we also have received quite a bit of rain and snow to lessen our drought conditions. 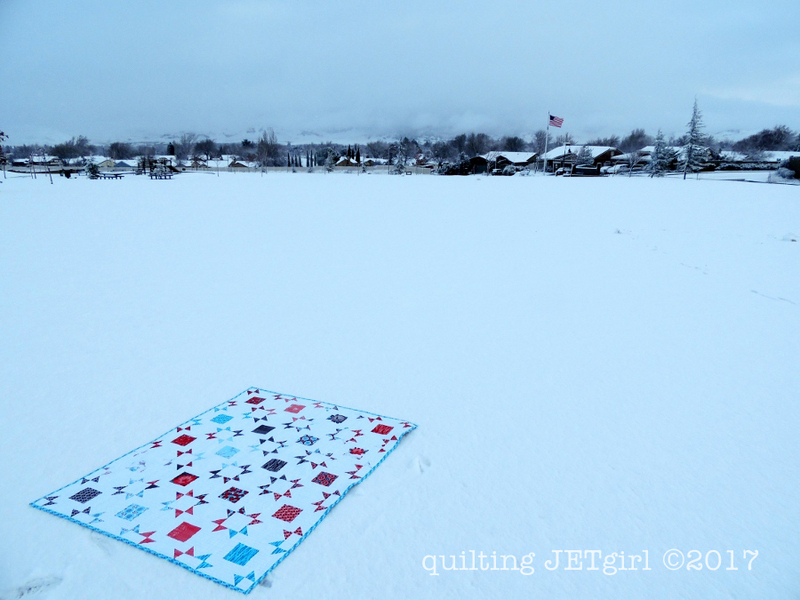 Such a harmonious effect occurred with placing the Layer Cake Pop quilt on top of the barely touched snow in the park. Creating this setting with your beautiful quilt was a brilliant idea! Quite often, I do not like to have an overabundance of white between the “stars”. Yet, in this quilt, the larger sections of white enhance the fabric colors so much more; making them each a point your eyes want to stop and study the details of each one individually! I thank you for sharing your Layer Cake Pop quilt and have an excellent day! Beautiful quilt Yvonne and the way you quilted it is perfect! Great design and I really like the colors and prints you mad the quilt with. Love how this turned out. The wait, after the teasing on Instagram, was worth it. Great job on not messing up the snow. Very pretty and pictured in the snow, neat. looks great- really do like the layer cake you chose to work with and the straight lines are perfect for it! So this was your secret sewing project from IG! It looks great and I love the fabrics that you used. wow this is a very pretty quilt. I love the fabrics you used. Neat version! I like your color combo. It looks beautiful in the snow! Sew fresh! I love your version!! great landscape! That backing looks like it shimmers in the snow. Beautiful quilt! Great quilt Yvonne and I love the straight lines. I still haven’t done a quilt with JUST straight lines yet but maybe I should!! Get shots aswell. Hmmm, I like several things about about this quilt. 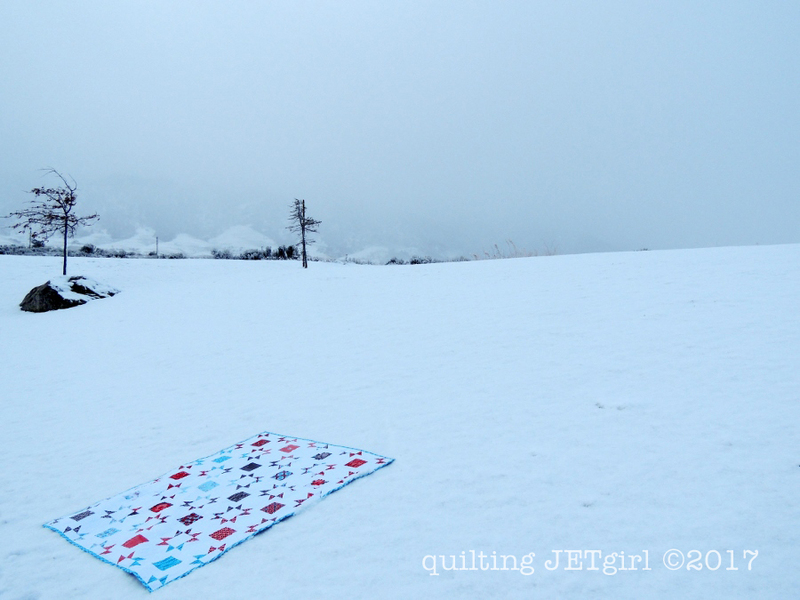 The open white space is very pretty, the colors shine and more than that, it lends a peaceful look to the quilt. Or maybe that is the snowy spaces you took pictures in. Also like the straight line quilting. Sometimes it is nice to have a quI’ll with simple structure, fabric and quilting. Far from boring, I think it is classic and one I wouldn’t soon tire of. Very pretty! Lovely quilt! And nice work with the photos – you have snow! I feel cooler already! Awesome quilt and photo shoot as well! So crisp and pretty! Such fun to see the various versions of this pattern! Gorgeous quilt! I always like how you quilts are photographed. Great job on this cute quilt. I always find it hard to take snowy pictures without mucking it up. Your photographs look really good. so so pretty, I love the colors you chose and am very interested seeing your upcoming tutorial. Oh this is a GORGEOUS finish Yvonne! 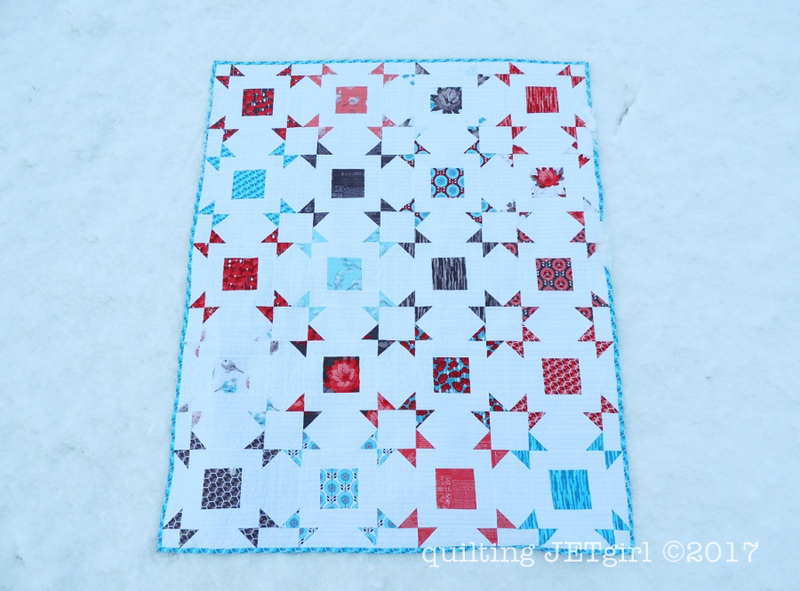 I am having a love affair of late with turquoises and reds, so it was wonderful to see your quilt upon that crisp fresh snow! Very pretty quilt but I love your photo shoot! I really like this and plan to make up a layer cake soon. It does pop! It’s a delightful quilt, and the quilting is great for this design. Thanks for sharing this! I love this! The colors you used are perfect. Thanks for the inspiration. I think you picked the perfect fabrics for this design – it’s just beautiful! And your photos are gorgeous! Beautiful quilt. The snow photos are gorgeous! Congrats on a wonderful finish. I love your take on the quilt…your photographs are beautiful too. Looking forward to your tutorial on directional prints. 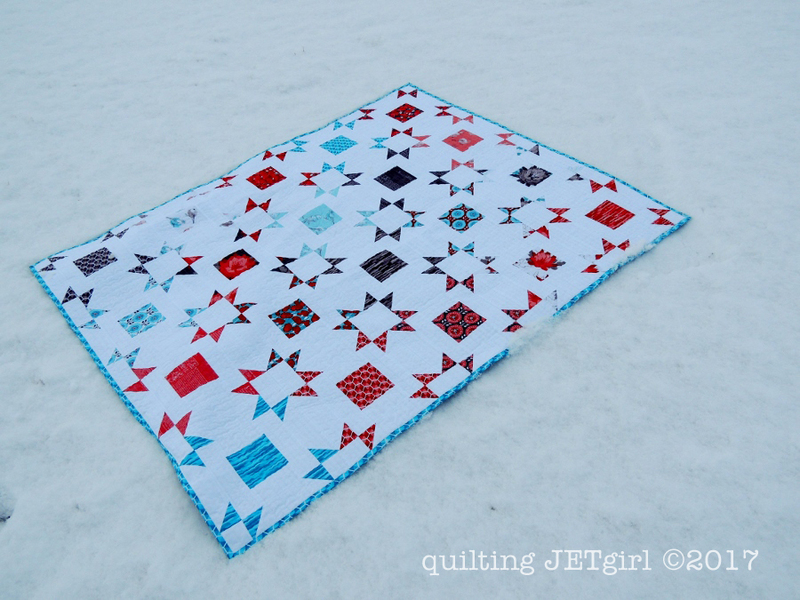 This is a great looking quilt and it really shows a beautifully on that freshly fallen snow. Bravo to you for another accomplished finish. Seeing your quilt on Instagram doesn’t compare to being able to take in all these beautiful photos shared here on your blog. 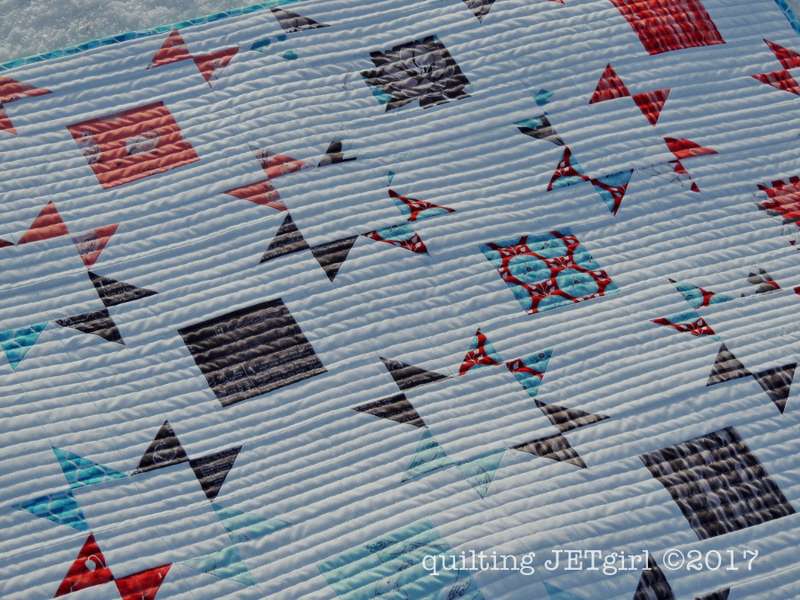 It took me a while to discover how the blocks are actually each pieced from one print because the secondary design containing the mix of prints really stands out and gives this quilt a deceptively scrappy appeal. Our snow has been sparse compared to normal this year. Sure does make a lovely backdrop! 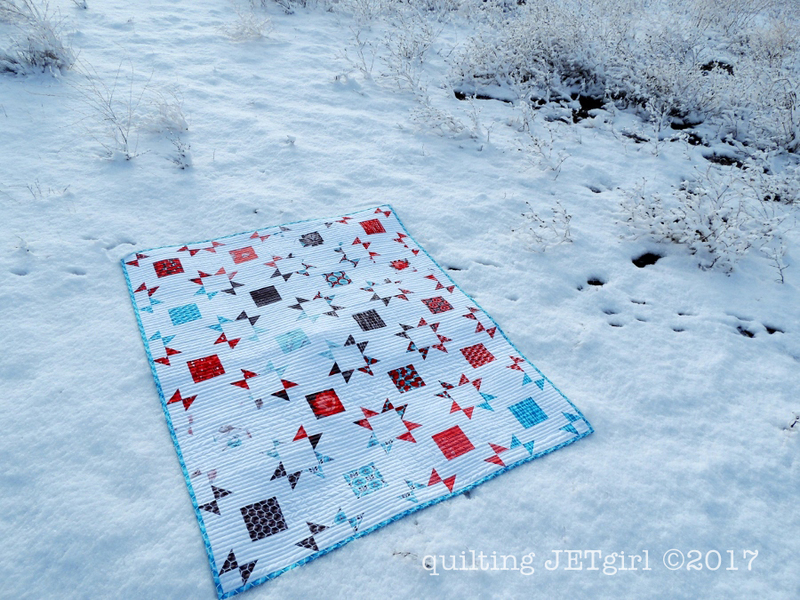 Early snowy morning … you did a great job getting the light just right for the photo – and a great job on that beautiful quilt! The Desert Bloom fabric looks great with this pattern and your quilting, as always, sets it off to a tee! Lovely! I like your fabric choices a lot, and the way the colours move across the quilt. The snow makes a perfect background for the photos too. It’s a great pattern, and your colours are great. I think it’s hilarious that California has snow and we don’t. Not that I’m complaining — I’m ready for winter to be over and looking forward to some daylight and sun. The “organic” spacing on the quilting is a really nice touch! I get locked into being way to precise with my spacing sometimes, but somehow that simple difference gives it a really nice and relaxed look. Great work! This quilt is so pretty! I”m surprised how much I like the simple straight line quilting. The third picture of it in the snow I thought was white sands at first…my brain did a double take, haha. I like that even though this quilt is red white and blue it doesn’t scream PATRIOTIC at all, probably since there are different shades of blues and reds. Your version is beautiful, Yvonne! 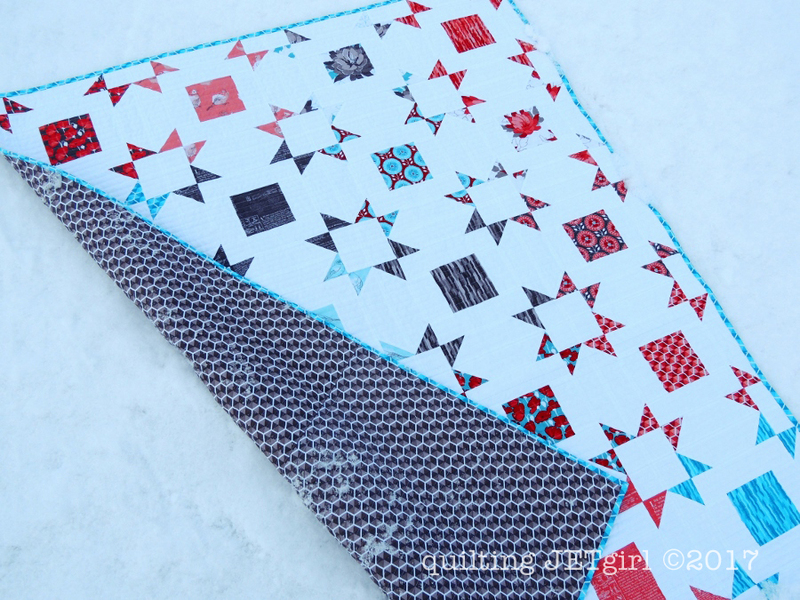 The simple straight line quilting is perfect for it. It’s great that you’re getting some snow to help with the drought.